Curvy Moon is a beautiful garter stitch shawlette accentuated with stripes and wavy border. Curvy Moon drapes lovely around the neck and shoulders. The shawl is knitted sideways seamlessly. This is a great beginner project and a nice relaxing project for the experienced knitters. The design uses very little yarn (165 yards of each color of 5ply/sportweight) while still giving a shawl of generous size. 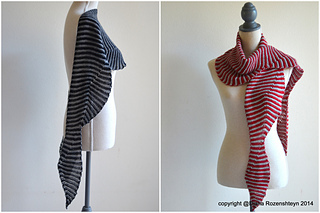 This is a great project for utilizing the leftover yarn from the stash. Choose your favorite colors and have fun knitting Curvy Moon. The sample shawl in the photographs after blocking was 184cm (72.5 inches) for the straight edge on the top of the shawl and 25cm (10 inches) for the height of the shawl at the center. You can easily make it bigger or smaller. The gauge is not critical in knitting this shawl. Adjust your needle size to suit your yarn and achieve the size and the look of the scarf of your choice. Color 1: Classic Elite Yarns Fresco, Sport / 5 ply (60% Wool, 30% Alpaca, 10% Angora), 1ball (164 yards / 50 grams) in colorway Red (5355). Color 2: Classic Elite Yarns Fresco, Sport / 5 ply (60% Wool, 30% Alpaca, 10% Angora), 1ball (164 yards / 50 grams) in colorway Cinder (5303).